Jesus Lives! is brightly displayed on every pouch and wrapper. Each Scripture Candy stand-up pouch contains 10 rich, smooth, milk chocolates. 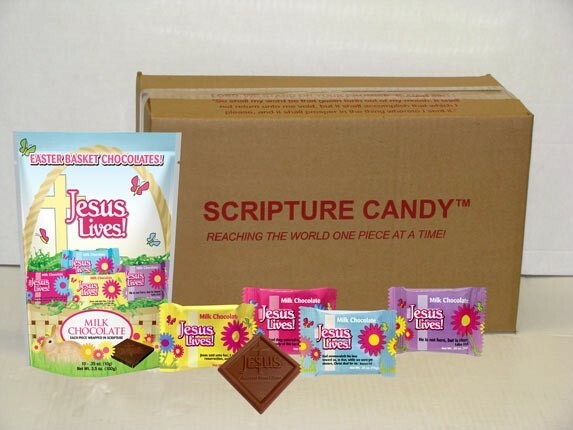 Each chocolate is individually wrapped in colorful foil using one of 36 different scriptures. Proudly made in the USA. Great for Easter baskets! Manufactured in a facility that also processes egg, wheat, and peanuts/tree nuts. Contains: dairy and soy ingredients. May Contain: traces of peanuts, hazelnuts, almonds, walnuts, and/or cereal-derivatives.